USC was supposed to be the team that would end the SEC's reign, but that dream crumbled Saturday night thanks to nemesis Stanford, who beat the Trojans 21-14. 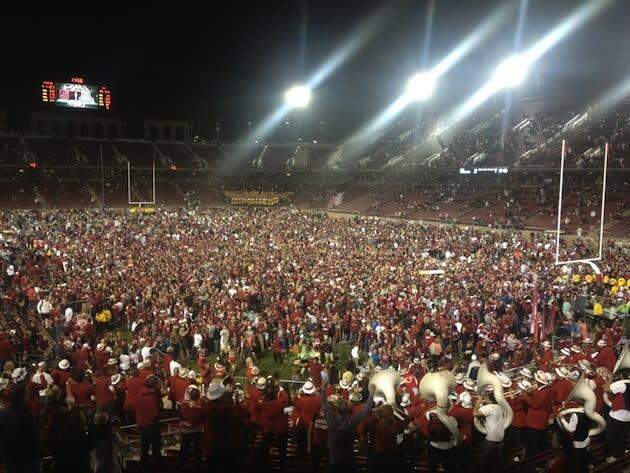 It was Stanford's fourth consecutive win over USC, the longest steak for the Cardinal, and the fifth win in six years. While USC came into the game with a Heisman contender at quarterback, two star receivers and a good running back corps, the game was ultimately won in trenches. Stanford's defensive lines gave Barkley little time to throw and held the Trojans' rushing game to just 27 yards on 23 attempts. Stanford sacked Barkley five times, including twice on USC's final drive. Barkley will graduate from USC having never beaten the Cardinal. It's a shocking defeat and it opens the door for teams such as LSU and Oregon. Oklahoma and Florida also could sneak in there, but as it stands, it looks like we're headed for a repeat of last year's national championship. Alabama, which annihilated Arkansas earlier in the day, seems well on its way toward cementing another spot in the national title game. For Barkley, who came back to USC for his senior season because of "unfinished business," this has to sting. Even though all of his other personal goals and USC's goals are still out there — albeit a little more difficult to attain — this was very much a winnable game. This is the same Stanford team that struggled against San Jose State to open the season. But the Cardinal exposed some major weaknesses that no one really knew the Trojans had basically because they had played weaker competition. The play of the offensive and defensive lines will have to be addressed and shored up quickly. Next weekend, the Trojans play an upstart Cal team that probably should have beat Ohio State on Saturday. Can the Trojans still win the Pac-12 and find its way into the national championship? Sure, but it's got a much more difficult climb than it did a week ago.